This week is the 100th anniversary of the beginning of the February Revolution of 1917 in Russia. (We know it is March now but that is due to a calendar glitch which need not detain us further.) Honest History will be posting something shortly (now posted here) on how the upheaval in Russia was greeted in Australia. Meanwhile, here is a link to five lectures forthcoming (the first on Sunday morning, 12 March, 9.00 am AEST). The lectures explore aspects of the Revolution and, among other things, how it impacted on the Great War. They are put on by the Socialist Equality Party (SEP) of the United States, the World Socialist Web Site (WSWS, always a useful alternative news source) and the International Committee of the Fourth International (ICFI). The first lecture is from David North of the SEP and WSWS, the third is from Nick Beams, an Australian member of ICFI, and the fifth is by James Cogan, national secretary of SEP Australia. There is also this excellent chronology, ‘This week in the Russian Revolution’, on WSWS. Today, 10 March, 100 years ago, for example, massive strikes were getting under way in Petrograd (St Petersburg). Update 16 March 2017: English translation of an article by Trotsky, 100 years ago today. Update 19 March 2017: useful Twitter posts on Russia in Revolution put up by @alphahistory. The new government cannot give the peoples of Russia (and the nations tied to us by the war) either peace, bread, or full freedom. The working class must therefore continue its fight for socialism and peace, utilising for this purpose the new situation and explaining it as widely as possible among the masses. The new government cannot give the people peace, because it represents the capitalists and landlords and because it is tied to the English and French capitalists by treaties and financial commitments … Only a workers’ government that relies, first, on the overwhelming majority of the peasant population, the farm labourers and poor peasants, and, second, on an alliance with the revolutionary workers of all countries in the war, can give the people peace, bread and full freedom. Among other material we found on the Revolution, there are the New York Times articles by John Quiggin (University of Queensland) and David Priestland (University of Oxford). 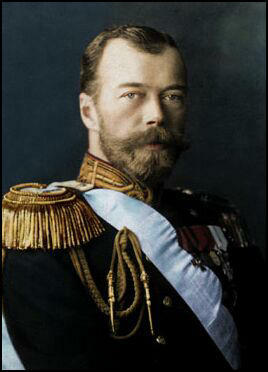 Czar Nicholas of Russia abdicated on 15 March (2 March old style). Quiggin speculates what would have happened on the battle front had the Russian post-Czar government – one of them, there was great confusion and rapid turnover during 1917 before the Bolsheviks came to power in November (October old style) – pursued possibilities for peace. The February Revolution is one of history’s great “What if” moments. If this revolution … had succeeded in producing a constitutional democracy in place of the czarist empire as its leaders hoped, the world would be a very different place. If the leading figure in the provisional government, Aleksandr Kerensky, had seized on an opportunity presented by a now-forgotten vote in the German Reichstag, World War I might have been over before American troops reached Europe. In this alternative history, Lenin and Stalin would be obscure footnotes, and Hitler would never have been more than a failed painter.